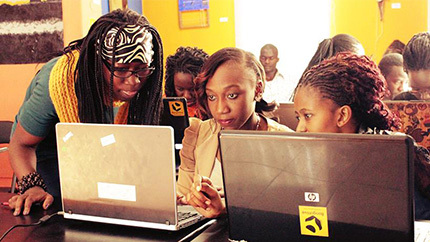 Fulbright U.S. Student alumna Joy Buolamwini launched her “Code 4 Rights” project to promote women’s rights through technology education at the Clinton Global Initiative Conference held September 21-24, 2014 in New York. Joy, a passionate advocate for increasing STEM education, developed Code 4 Rights with the mission to ensure that every country in the world has accessible information about local services that support women’s rights and that women are given the opportunity to create beneficial technology. During the Clinton Global Initiative Conference, Joy had an opportunity to meet former President Bill Clinton and speak alongside the president of Intel Foundation, the CEO of the Anita Borg Institution, and the senior advisor to the White House on Technology and Innovation. Joy is about to embark on the second year of the Rhodes Scholarship and is poised to be the first Rhodes Scholar to pilot a year of service.